Objective: The aims of this study were to: a) evaluate tumor response rates using modified- Response-evaluation-criteria-in-solid-tumors (mRecist) criteria, b) evaluate safety of Degradable Starch Microspheres Trans-arterial-chemo-embolization (DSMs-TACE) for unresectable hepatocellular- carcinoma (HCC) treatment. 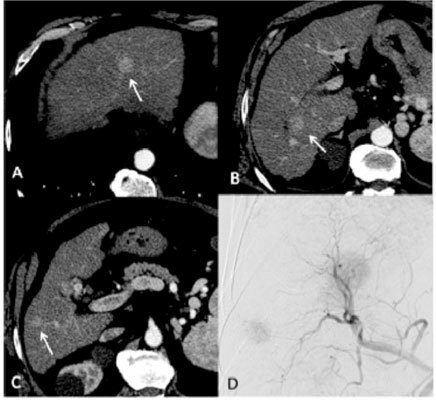 Materials and Methods: We prospectively enrolled 24 HCC cirrhotic patients (21/3 M/F, mean age 66.3 years) to be treated with repeated DSMs-TACE procedures, performed at 4-6 week intervals on the basis of tumor response and patients tolerance. Clinical and biochemical evaluations were performed before and after each procedure. Treatment response was also assessed by Computedtomography (CT) or Magnetic-resonance-imaging (MRI)-scan 4-6 weeks following each procedure. Results: In our experience, DSMs-TACE was both safe and effective. A total of 53 DSMs-TACE procedures were performed (2.2 per patient). No procedure-related death was observed. Complete Response (CR) was observed in 5/24 (20.8%), 4/17 (23.5%) and 5/12 (41.6%) patients after the first, second and third procedure, respectively. At the end of each treatment, all patients experienced at least a partial response. At the end of the repeated procedures, no differences between mono- or bi-lobar disease were observed in patients with CR (64.2% vs 50%; p=ns). In most cases, treatment discontinuation was due to worsening liver function. Conclusion: DSMs-TACE is a valid, well-tolerated alternative treatment to Lipiodol-TACE or DEB-TACE, as it has demonstrated to achieve a relatively high percentage of complete tumor necrosis. CR rates were similar between patients with mono- or bi-lobar disease indicating the possibility of carrying-out repeated procedure in a safe and effective way in both types of patients. Hepatocellular carcinoma, transcatheter arterial chemoembolization, degradable starch microspheres, recurrencefree survival, locoregional therapies, HCC cirrhotic patients.